Today I have two cards from one pre-made background. This one was a 'smooshed' watercolour background that was in my stash. I cut the background in half diagonally and then used a MFT 'Homespun Stitches' die on the edge of one. 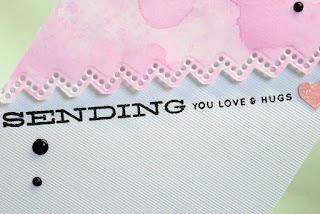 I then mounted it on to a linen card base with fun foam, added a sentiment, a punched out glitter heart and a few black dots to tie in the black sentiment and that was number one card. The second card, I wasn't so pleased with . . . it was too 'busy' for my taste, but I am going to show it anyway just to demo what I did with the second half of the background piece. Here are the two cards. Here is the second card. i don't think your second card is too busy at all - both really pretty cards. don't you just love having those smooshed backgrounds on hand to make a card!! 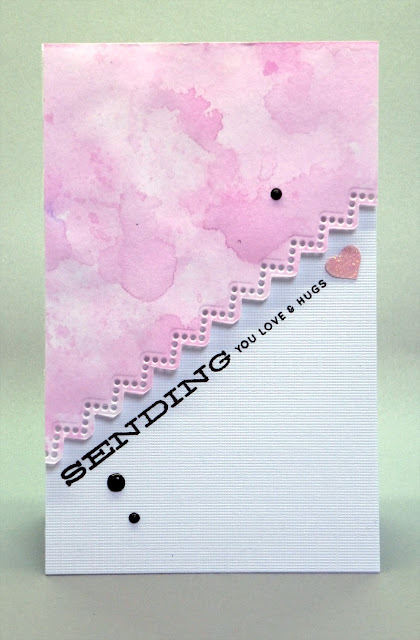 How can cards with pink cannot be lovely ? Loved them and specially the second one more. black silhouette pops beautifully on the soft pink bg ! I love both of your cards equally. So smart to get 2 cards out of one pretty background. I really like both of your cards and the background is amazing! OMGosh Hazel my dear, no, no, no your second is NOT too busy it is absolutely gorgeous. Both your card are fabulous. 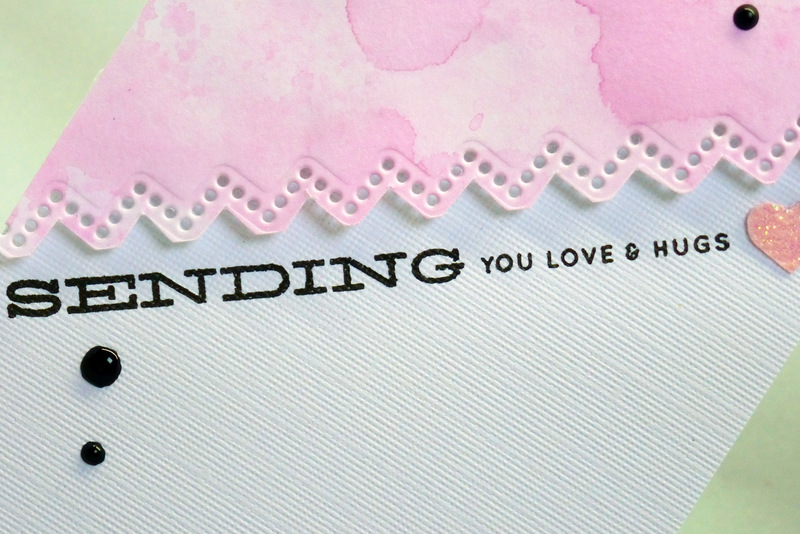 I LOVE that smooshed background in the soft pastel pink gorgeous colour. And the combination with the black is just fab. Stunning two cards my friend. Both cards are great! I love the pink and black with white. 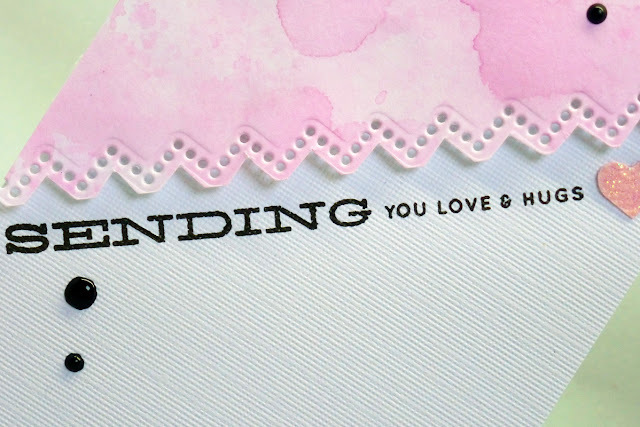 Your sending love and hugs card is so dainty and sweet! I love the other card with the flower and leaves. I think it has perfect balance! These backgrounds have so much depth and your cards are both beautiful, I love the fun die cut edge you chose! Two lovely cards! I don't think the second one is too busy! Not at all! That flower is beautiful with the pink background! Hazel, what a pair of beautiful cards. 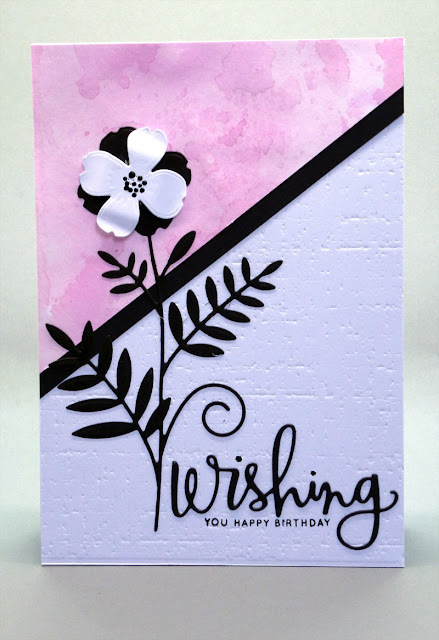 I love that gorgeous pink and with the black is so striking! I think both card are just super gorgeous, Hazel!!! 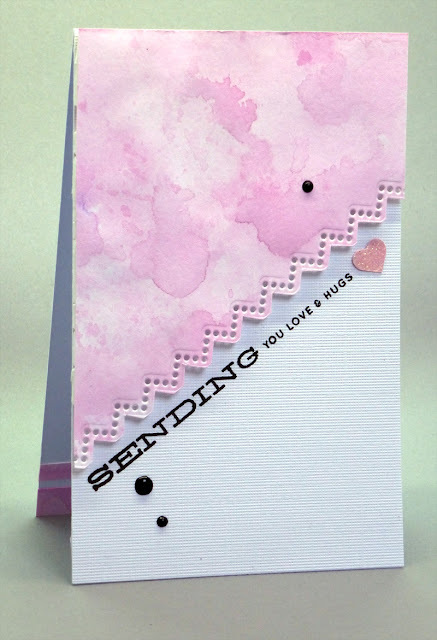 That is such a wonderful dotty border you've got on the first card and the flower on the second one is just stunning!!!! 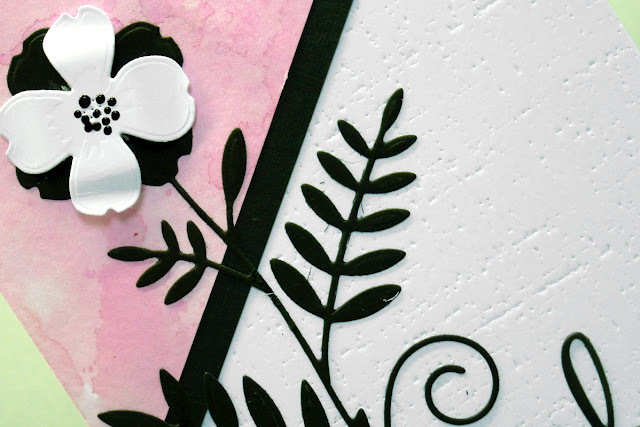 I love all the black on the second card and I really like that EF you have used for the lovely texture!!! Your pink panel is so beautiful!!!! These are so beautiful, my friend!!! Both of these are amazing, my friend! That background has the most beautiful colors and blooms! I love it with the black and think the 2nd is as pretty as the first! WOW! Pretty in pink... I had to say it! Love both of your cards, that background is great. I think the second one is my favourite though, love that flower ! These are so beautiful! Your smooshed background is wonderful. I especially love the black leafy die cut. The color contrast between it and the pink background is wonderfully dramatic!